Did you know that Lasting Impressions is not “just a one trick pony!” There are so many thing you can do, i.e., emboss, of course, with more than 1800 brass templates; make greeting cards and other craft projects with their beautiful cardstocks; and, there are endless ways and ideas using their MemoryMixer Scrapbook program … not to mention their Colored Impressions Software also! Oh my goodness, the list goes on and on! I, for one, craft with Lasting impressions almost every day. The project above is just one of my recent endeavors. I purchased some wood letter blocks and the race was on to replace the “O” in the word HOME. This idea came from a company called Foundations Decor and along with another company called The Wood Connection, I managed to fill the “O” spot with 12 different images and here’s the kicker … all images are covered with Lasting Impressions’ Cardstock! Yep … every last one of them. Here, for example, is Mr. Waddles and he is the most special image, out of the twelve, because he was actually created, and gifted to me, by LI Blog Design Team Member Barbara! She used some older LI cardstock and embossed with LI Template #L9348 (flower petal) for his feet and LI Template #L9816 (wreath bow) for his necktie. Isn’t he adorable? I love him! Isn't this just the cutest puppy? The stamp is from Art Impressions and I colored him with my Copic Markers. 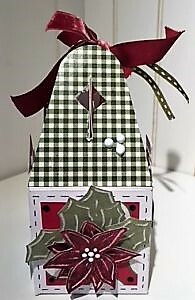 The background plaid paper is from Lasting Impressions. Here's another Art Impressions Stamp. 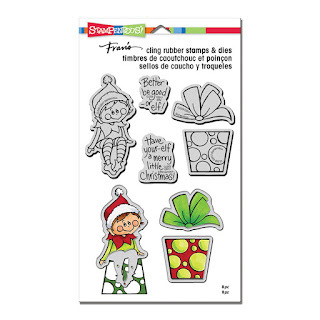 This adorable Elf was supposed to be a shaker card! However, I preferred to just mount the top of his present with no Wobble. Kristina Werner designed this Owl Card that I pinched and after much coloring, again with my Copic Markers (lots of them! ), I mounted the Owls on the perfect plaid paper by Lawn Fawn. The Owl's wings "flutter" when you pull the tab. I nearly wore out that tab ... pulling it over and over again! :-) The stamp is from Art Impressions and it comes with the dies. Yesterday I made this Shaker Card. L.I. Template #L9538 Apple Cider Jug. I used Colored Impressions' Software to create the tiny apples to use inside the jug, along with red and green sequins. 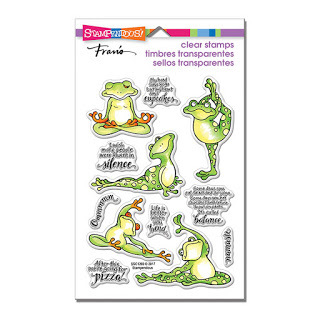 OMG, this stamp set from Stampendous is so adorable. 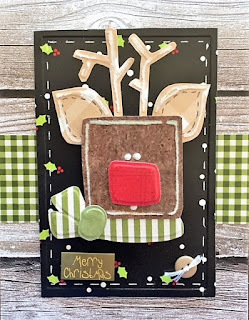 It just makes me smile and it's the next stamp set to be used on THE STENCIL SPECIALIST'S Monthly Blog Hop Challenge. In fact, it's owner Julie's last competition for the year. BETTER BE GOOD OR ELF CHALLENGE! Welcome to another Blog Challenge hosted by owner Julie at the Stencil Specialist. 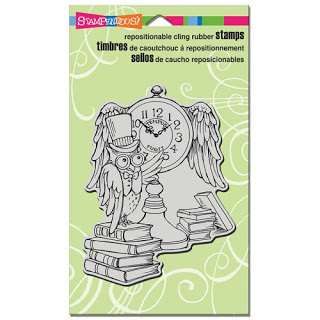 The focus of this challenge is a beautiful owl and clock stamp from Stampendous entitled Owl Clock.